Another great breakdown by Megan of a place that not many may know about. Looks beautiful and worth the trek if you are visiting Norway in the future. If you sell on eBay then you wanna try to keep as close to 100% as possible. Don’t be afraid to fight for your feedback score. Hopefully you were able to snag the Business Platinum before the fee increased to lock it in one more time. The additional card benefits that they added to “justify” the increase are kind of junk but the Dell one is the best in my opinion. Greg gives you a good breakdown of how to max it out. I always enjoy decision making process articles. It is why I write them as well ;). What I take from this is that living near a major airport is a huge plus many take for granted. 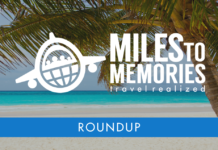 Previous articleGift Card Purgatory, 25% Off Amazon, Miles & Points Being Taxed & More! Years ago, I used to care about having 100% positive feedback but I stopped caring about the one or 2 idiots who leave negative feedback – just isn’t worth the time fighting it. I find very few buyers even look at the feedback these days, and don’t care if someone has 1 or 2 negatives. What is way more important is your seller score if you have an ebay store, because if your score gets lower than 95% your final value fee doubles. Good point on the 95% Jason. That can be a killer.